Oklahoma won at Ohio State in Week 2. When Ohio State suffered a 31-16 home loss to Oklahoma in Week 2, many college football fans and prognosticators wrote off the Buckeyes, the preseason No. 2 team in the AP Top 25 poll. Defenders of The Ohio State University answered by citing 2014, when the Buckeyes lost at home to unranked Virginia Tech in Week 2, then won their next 13 games en route to a national championship. Both sides have an argument about the cost of losing at home. 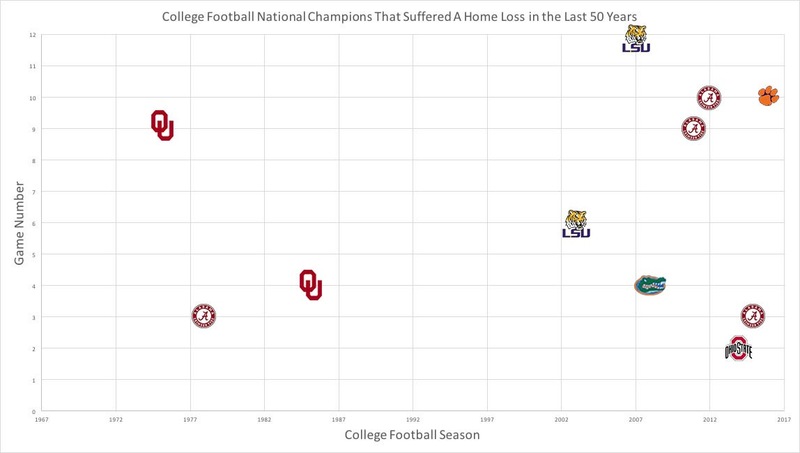 Only 11 teams in the last 50 years have suffered a home loss during the season and gone on to win the national championship. But eight of those 11 have come in the last 13 years. While not recommended, a team can lose at home to an unranked opponent and still contend, if not win, a national championship. Seven of the 11 title-winning teams that lost at home in the last 50 years were upset by an unranked opponent. Pittsburgh beat Clemson in 2016, Virginia Tech beat Ohio State in 2014, Ole Miss beat Florida in 2008, Arkansas beat LSU in 2007, Florida beat LSU in 2003, Miami (FL) beat Oklahoma in 1985 and Kansas beat Oklahoma in 1975. Florida and LSU have been on both sides of the equation, winning a national championship despite a home loss and defeating an eventual national champion on the road. Alabama, LSU and Oklahoma have won multiple national championships in the last 50 years despite suffering a home loss in each title season. Of the 11 national championship teams that lost at home in the last 50 years, five suffered a loss during one of their first four games and five lost during one of their final four regular-season games. Only one team — LSU in 2003 — lost in the middle of the season, when the Tigers lost their sixth game of the year. Of the teams studied, Ohio State suffered the earliest home loss (Game 2 in 2014) and LSU suffered the latest loss (Game 12 in 2007). The Tigers actually lost twice that year, both in triple overtime, though only one was in Baton Rouge. After that loss to Arkansas, LSU beat Tennessee in the SEC title game in Atlanta, then knocked off Ohio State in the national championship game in New Orleans. Who could be the next team on the list? In each year of the College Football Playoff, the national champion suffered a home loss during the regular season. Ohio State made the playoff in 2014 but its loss to unranked Virginia Tech dropped the Buckeyes to the No. 4 seed. They went on to beat No. 1-seeded Alabama and No. 2-seeded Oregon to win the title. While the college football season is still young, Ohio State may the most likely candidate to add its name to this list, given its home loss to Oklahoma. With upcoming games against No. 4 Penn State and No. 8 Michigan, plus a possible Big Ten championship game appearance, the Buckeyes could theoretically build their resume to warrant inclusion in this season's playoff. Two highly ranked teams that are scheduled to play challenging home matchups in Week 4: No. 6 Oklahoma State (3-0) hosts No. 16 TCU (3-0) and No. 11 Georgia (3-0) welcomes No. 17 Mississippi State (3-0).